Avenged Sevenfold have confirmed that they are going to be in the studio next month, to start recording their follow-up album to Nightmare. They have already written a new song called “Carry On” that has appeared on Call of Duty Black Ops II. To see a video of the song, visit: http://www.nme.com/news/avenged-sevenfold/67828. Muse has helped to raise awareness of dementia at their concert in Belgium. They then performed in Antwerp as a part of their world tour. Muse is also set to perform in the UK next summer for a four-date stadium tour. They will start off their shows at Coventry’s Ricoh Arena on May 22, 2013 and they will then play dates at London’s Emirates Stadium on the 25th and 26th. Muse’s tour will end at Manchester’s Etihad Stadium on June 1. The band has also announced that they will headline Rock in Rio in September, and on September 14th, they will be supported by Alice in Chains. For ticket availability and the latest listings, be sure to visit: NME.COM/TICKETS. A Day to Remember have just release a new track titled, “Violence (Enough is Enough)”. They have set do release their new album Common Courtesy in 2013. Fans of A Day to Remember can stream the new track at: http://www.adtr.com/. A Day to Remember are also going on a US tour in spring 2013. For a complete list of tour dates, be sure to visit: http://www.altpress.com/news/entry/a_day_to_remember_stream_new_song_announce_2013_tour_dates. Circa Survive has released a new music video for their song, “Sharp Practice”, which comes from their new album, Violent Waves. To see the video, be sure to visit: http://www.altpress.com/news/entry/circa_survive_release_sharp_practice_video. Deadmau5 has joined Swedish House Mafia in headlining both weekends at Ultra Music Festival this following year. Only two names have been mentioned to be performing at the event so far. Deadmau5 was not concerned with being overlooked in 2012, so expect to see performances on both Saturdays of the festival! Adele has been named Entertainer of the year by the Associated Press. This title is given to the person whom had the most influence on entertainment and culture that year. She beat Taylor Swift and Psy, who were also on the poll. Adele’s song, “Someone like You” has also been named the most popular karaoke song of 2012 by Lucky Voice. Adele has recently had her first child and has recorded the theme to the latest Bond film, “Skyfall”. Tinie Tempah has announced that he has finished recording his second album. The UK rapper has said that he hopes to release the album next summer. Tinie Tempah has worked with Diplo on the album and he has also noted Coldplay’s Chris Martin to be an influence on the album. It was reported that Carrie Underwood got sick this past weekend. When performing in Des Moines, Iowa, Underwood had a difficult time getting through her set. In a raspy-voiced apology, Underwood told the audience that she wouldn’t be keeping the profits because she felt bad making money for that show. A charity in Des Moines will receive the profit. Underwood had to cancel her show in Kansas City, yet it was rescheduled for May 6th. Tame Impala’s album, Lonerism was named number one in NME’s Album of the Year list. Tame Impala’s Kevin Parker mentioned that he had spent many months assembling the album in many places around the world, yet he finds it difficult to be happy with his own work. Parker also believes that the album is his best work. To check out NME’s 50 Best Albums of 2012, be sure to check out: http://www.nme.com/blog/index.php?blog=147&p=13018&title=50_best_albums_of_2012&more=1&c=1. 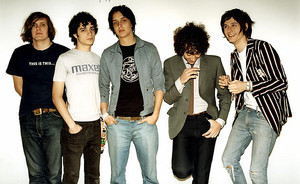 The Strokes’ Julian Casablancas has announced that the first signing to his new label, Cult Records will be the New York Band, The Virgins. The Virgins’ new album Strike Gently will be following to their self-titled debut. The new album was recorded in New York City at the East Village Recording Center and produced by Johnny T. Yerington. The Strokes have announced that they are working on the follow up to their latest release, Angles. Julian Casablancas mentioned that he does not think the band will go in an entirely different direction with their music, but that the songs will be different. Deadmau5 played a secret gig in London recently and it was said that he lit up the street with his audio and visual performance. Deadmau5 also played an audio and visual show in Southwark’s Flat Iron Square. The performance was organized by moblie Phone giant Nokia, in promotion for their new Lumina phone. To listen to the EMD producer’s music, check out his latest album release Album Title Goes Here which was released in September 2012. Lady Gaga has announced that she has written 50 songs for her upcoming fourth studio album, ARTPOP. Gaga has also mentioned in a tweet that she is not actually sure which songs will make the cut for the new album, yet that she used the same process with her old releases The Fame and The Fame Monster. She still has yet to reveal more details on the upcoming album. Carrie Underwood will take on the challenge of playing the iconic role of Maria Von Trapp in NBC’s live broadcast of The Sound of Music. The broadcast is based on the original Broadway musical by Rodgers and Hammerstein. While a date for the three-hour event has not yet been announced, the broadcast is expected to air during the 2013 holiday season.